When you think of giraffes, you imagine the long-necked, spotted animal we all know. 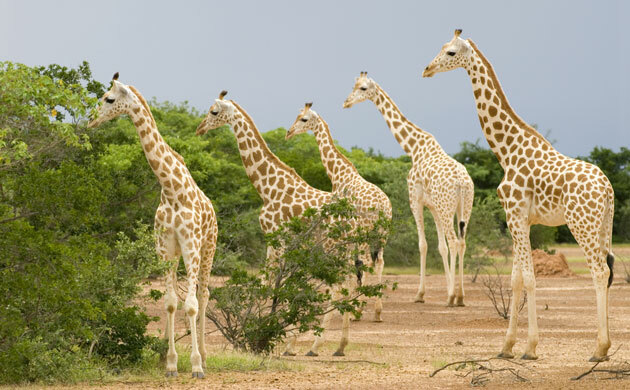 But German scientists have discovered that there are actually four species of giraffes. We used to think that there were nine subspecies of giraffes. The difference tween the different subspecies of giraffes was mostly based on their coat pattern. The Nubian giraffe, for example, has very dark spots on its body, while the Kordofan giraffe has pale spots. These different coat patterns don’t mean that the giraffes are different species. Instead they are different subspecies of an umbrella species of giraffes. This means that, when a giraffe of one subspecies, for example a Kordofan giraffe mates with a Nubian giraffe and they get a baby, that baby giraffe is also fertile. In other words, both giraffes belong to the same species. That’s a whole different species! But now, a team of German, American and South-African scientists have discovered that giraffes can be split into nine subspecies, but into four actual species. The scientists have split the old giraffe species into Northern Giraffes, Southern Giraffes, Masai Giraffes and Reticulated Giraffes. This doesn’t mean, however, that two giraffes from different species can’t have fertile offspring. They still can, but to the scientists’ surprise, they don’t interbreed that often in the wild. This is quite odd since giraffes can move big distances and could easily reach other groups of giraffes. And since different giraffe species don’t interbreed, this means that the four different species of giraffes are still getting more diverse. To define the different species, the team of scientists analysed the DNA of different giraffes and compared the results. They found out that some giraffes’ DNA differ even more from each other than a brown bear’s and a polar bear’s do. Those bears belong to two different species, so those two giraffes most likely belong to different species as well. After a detailed study of the DNA of a large group of giraffes in Africa, they discovered a total of four different species of giraffes. And this discovery has some important consequences for animal protection. The original giraffe species was already somewhat endangered; there are only 100,000 left, where there used to be 150,000 thirty years ago. This means that giraffes aren’t as endangered as rhinos or elephants. But since giraffes can be split into four species, three of those four species are seriously threatened with extinction. Only the Southern Giraffes seem relatively safe, while the Northern Giraffes, of which there are only 4500 left, and the West African Giraffes, of which there are only 400 left are classified as endangered. This new discovery now asks for better protection of and more attention to giraffes, otherwise one or more of these newly discovered species may be gone for good soon.